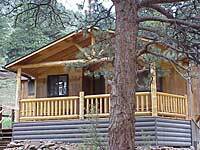 We list all of the Estes Park area cabins and cottages that directly serve Rocky Mountain National Park. If you know of any campground that we do not have listed, please contact us. 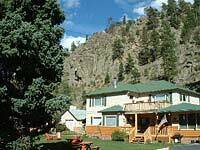 We are a small family-run cottage village within walking distance to Rocky Mountain National Park that welcomes pets and groups. We are conveniently located near shopping, outdoor and family activities. We offer clean, affordable cottages with kitchenettes and fireplaces where wildlife may visit your doorstep. all you need to bring is your food, clothes and your appetite for adventure. 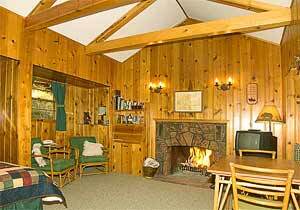 The cabins are open year-round and are the perfect get away able to accommodate couples or the whole family. 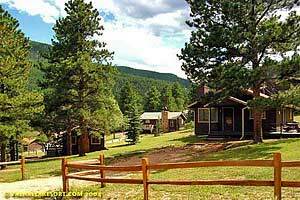 1, 2 and 3 bedroom cottages located in a beautiful, secluded setting within Rocky Mountain National Park. We are 1/2 mile from the highway where the road ends, and a National Park trail begins. This trail connects with other park trails. We are in a very peaceful location that is away from highway noise. Wildlife can be seen in our area. Peaceful Valley Ranch- The Colorado experience for over 50 years. 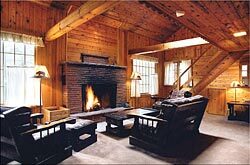 Imagine pine paneled lodge rooms and cozy cabins with fireplaces and hot-tubs along a rushing stream. Hiking and riding through wild flower valleys to alpine lakes and waterfalls. Incredible meals like “breakfast on the mountain,” steak cook-outs and a riverside lunch. Activities include barn dances, “Old West” nights, overnight campout, historical and scenic tours, shopping trips, and rodeo. Great children’s programs like pioneer days, gold panning, the kiddy barnyard and riding instruction. Peaceful Valley Ranch is open year-round for holiday celebrations, family reunions, and romantic getaways. Groups enjoy retreats and meetings in the state of the art conference center and unique teambuilding activities. Memorable, romantic weddings are held in the Alpine Chapel or Mountain View amphitheater, with receptions in the 1930’s era dance-hall and riverside dining room. Near Estes Park and Rocky Mountain National Park . 90 minutes to DIA. Pine Haven Cabins are located on Fall River Road and Fall River runs through it. Excellent fishing is only one of the benefits of staying at our cabins. 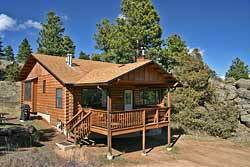 Country Cabins at Pine Have have knotty pine interiors, fully equipped kitchens and 20" cable TV. Our cabins are located around a central barbecue area where often times guests gather to picnic and enjoy visits with other guests. All cabins have decks with barbecue grills and chairs so that you may sit outside your cabin and enjoy the fresh smell of pine, the great mountain views, and hummingbirds drinking from your own bird feeder. Estes Park’s premiere family vacation spot. Whether hiking, watching wildlife, laying by the pool, shopping, reading, or enjoying a day in Denver, Rams Horn has so much conveniently close by. 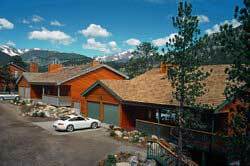 Two-bedroom, two-bath, two-story luxury vacation homes located at the east entrance to Rocky Mountain National Park. Gas fireplace, full kitchens, TV/VCR/DVD, charcoal and gas grills. Homes sleep up to six. Outdoor hot tubs year round, swimming pool from May to October. Free wine and cheese reception every Saturday from 4:30-6:00. RCI Gold Crown resort for fifteen consecutive years. Exceptionally friendly and well-informed staff. Rent for a day or a week, or own forever. The cabin at Riverside Retreat is fully equipped and offers a quaint mountain and river setting. Enjoy the great outdoors and wildlife and relax by the river. 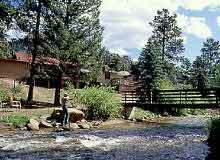 Leave your car at the cabin and walk five minutes along the Riverwalk to downtown Estes Park and attractions. 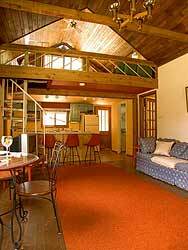 The cabin has one bedroom, a cozy loft, living room with a wood burning stove, and a kitchen with everything you need. Sleeps up to four comfortably. Gas grill, picnic table, lawn furniture and outdoor fireplace are all provided. Three miles to the entrance of RMNP. Location, cabin amenities, and private cabin grounds and riverfront make this a perfect fit for an individual retreat, romantic getaway, or as a vacation headquarters. Rockmount Cottages offer a peaceful, scenic setting with open space and picturesque views of the Rocky Mountains. We feature individual cabins, tastefully decorated and sparkling clean. 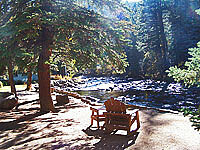 Guests enjoy over a half mile of the Big Thompson River that runs through our resort. Our cabins have knotty pine, mountain decor, fully equipped kitchens, fireplaces, cable tvs/vcrs, outdoor grills and picnic tables. Enjoy a vacation with everything ...peace and quiet to outdoor adventure. 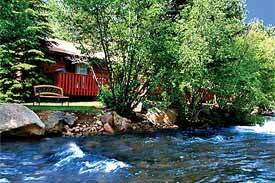 Lodging in sparkling non-smoking cabins on the Big Thompson River. Enjoy crisp mountain air and rippling trout stream from our fabulous riverside deck and flagstone riverwalk. Private in-room spa cabins with wood-burning fireplaces, CCTV, VCR/DVD's, and all the comforts of home. Feel at one with nature at its best and your loved ones by your side, as well as your pets! Come refresh and renew yourself at Skyline Cottages...where the river meets the mountains. Our 45 new cabins are located on nine, wooded acres. Each luxury cabin (1,200 sq. ft) has two bedrooms and two baths, full kitchens and living room with gas log fireplace, washer/dryer, and full deck with gas grill and patio furniture… Best of All-they are individual cabins with true mountain charm. Stargaze from the on-site hot tub. (All cabins are non-smoking & no-pet units). 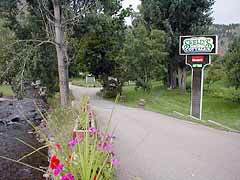 We are located two miles east of downtown, easy access to Rocky Mountain National Park; and directly across the street from the Lake Estes Trail that leads to Stanley Park, Lake Estes and just minutes from the 18-Hole Golf Course. Nestled between the cool rushing waters of the Fall River and the granite peak of Old Man Mountain, Streamside is one of the Rocky Mountains most unique resorts.Situated well off the highway with 19 luxury cabin-suites among 17 acres of wooded setting with an abundance of wildlife. If seclusion and privacy is your idea of the perfect vacation, we have both. Just relax and take in the peaceful tranquility of our quiet mountain resort. All of our units include telephone, cable TV and HBO. We also have gas logfireplaces and fully stocked kitchens and some units feature a cultured marblehydrotherapy jetted tub. Enjoy viewing the wildlife on your private deck/patiowhile cooking on your own gas grill. Our property features a relaxing enclosed swimspa for your pleasure. One third is a hot tub and the remaining two-thirds measures 20 X 8 and has three swim-against jets for treadmill swimming or water aerobics. 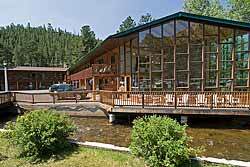 The Swiftcurrent Lodge is located on the Big Thompson River right next to Rocky Mountain National Park. Begin your hiking adventure right from your doorstep or relax near the river or in the hot tub. Enjoy an evening campfire where you can relax, roast marshmallows and reflect on your day, contemplate your tomorrow. We are a small property with only 12 units, most with kitchens, BBQ's and picnic tables, some with gas fireplaces. Our small size invites peace and quite in a tranquil setting. Come experience our backyard today, we'd love to share it with you. Trails West on the River is proud to offer you the choice of Cottages or our Luxury River Suites with in room Spas. Enjoy Fishing, Hiking, Wildlife Viewing and the soothing sound of Fall River as it makes its way through Trails West. Take a dip in the outdoor hot tub after you enjoy a day experiencing Rocky Mountain National Park. Our Cottages and River Suites feature Fireplaces, Kitchens, and Decks that overlook Fall River. Conveniently located between downtown Estes Park and the entrance of Rocky Mountain National Park on the Fall River, you will find Restaurants, Horseback riding, Shopping and Family Entertainment all within a 5 minutes drive. Please visit our website for more information on our property. We invite you to stay at Trails West in Estes Park during your next family vacation or romantic getaway, your hosts Jeff & Kris. 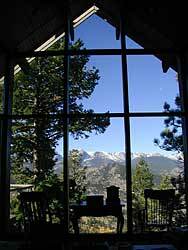 Located on 15 secluded acres, bordering Rocky Mountain National Park, just 10 minutes west of downtown Estes Park. All of our 25 immaculate cabins have full kitchens, living rooms with fireplaces, some private hot tubs or in room Jacuzzis, and decks with BBQ�s. We offer packages for your romantic getaway and packages for your call to adventure. In the summertime everyone will enjoy our heated swimming pool, miniature golf, volleyball, basketball or shuffleboard. Get hooked on Valhalla and see why we have so many return guests year after year! Located in a dramatic, mountain riverside setting… The Woodlands offers 16 one and two bedroom suites overlooking the sparkling waters of Fall River. Beautiful landscaping, trees over 300 years old and Castle Mountain views all combine to provide the perfect location for your vacation or getaway in Estes Park. Just two miles from the Fall River Entrance to Rocky Mountain National Park…you have easy access to over 350 miles of hiking trails, bountiful wildlife and scenic drives unique to this great national treasure. Also, The Woodlands is convenient to Estes Park shopping, dining and its variety of year-round activities. Yogi Bear's Jellystone Park of Estes is the gateway to the town of Estes Park and the spectacular Rocky Mountain National Park. Our resort offers 35 acres of hillside CAMPING and CABINS overlooking a beautiful mountain meadow that is surrounded by the majestic peaks of the Roosevelt National Forest. Jellystone Park offers heated pool, wagon rides with Yogi, activity programs for Kids and Adults and Yogi Theatre for cartoons and movies. Fun for kids of all ages! Yogi Bear  Copyright © 1999 Hanna-Barbera Productions, Inc.
Marvel at the glory of the Colorado Rocky Mountains from our lodge. Imagine yourself nestled in the majestic pines of Castle Mountain, located two miles from the National Park. Country Cabins at Amberwood consist of clean individual one, two, and three bedroom houses. These charming cabins are predominantly Ponderosa pine inside and out. The Grand Room Lodge is used for family reunions, church groups, and business conferences. It will accommodate groups of up to 35 people for the purpose of "being together". We invite you to come and experience the warm, friendly atmosphere and become part of the Amberwood family. We have three Year Round Free Standing Cabins for Couples that is perfect for that Romantic Getaway in the Mountains. Each unit comes with Private Outdoor Hot Tub, Spa tub/shower, Fireplace, Intimate lighting, Sat. TV,VCR/DVD, Stereo/CD Player, Propane BBQ Grill, phones and many more amenities. Three of the units are located by the Big Thompson River. 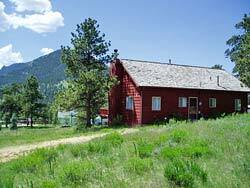 Our fourth unit, The Carriage House, is located within walking distance to RMNP and is .6 miles off from Hwy 66. Estes Park is a short 5 minutes. Massage Therapy offered in a beautiful Massage Room overlooking the River. Great for honeymoons and special occassions.........or just to get away. Take time for yourself, come and destress at Annies Mountain Retreat! 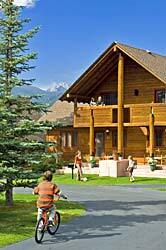 Aspen Brook Vacation Homes is a community of vacation homes located along the beautiful Big Thompson River. Our homes range in size from 3 to 6 bedrooms and can accommodate anywhere from 2 to 22 people. All of our homes offer full kitchens, living rooms with fireplaces and decks with gas grills. Each is privately owned and decorated so there is something for everyone, from casual to luxury! Some homes offer Jacuzzi tubs, private hot tubs, river and/or mountain views. We are just 3 miles from downtown Estes Park and 1.5 miles from the main entrance to Rocky Mountain National Park or just hike across the road from our property! Aspen Brook Vacation Homes is a non-smoking property and sorry - no pets allowed! Set well off the road, Bear Paw Cabin is a wonderful vacation home filled with a combination of cozy furniture, country antiques and decorated with teddy bears. The spacious floor plan offers privacy for extended families & friends. Includes 2 bedrooms and 2 family/living areas with several sleeper sofas. The "Paw" also includes a fully equipped kitchen, wet bar, laundry room, quality linens, TVs, VCR, Stereo, Micros and Phone. Our private wooded acre has picnic areas and BBQ grill. Our "Open Year Around" cabin is priced according to your group size making it affordable to all. 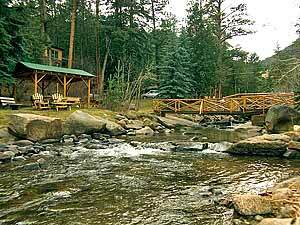 Nestled in the boulders and Ponderosa pines of the Big Thompson Canyon and 20 feet from the "best Private Water fly-fishing" on the Big Thompson River, is where your vacation begins.....only 3 miles from the bustling streets of Estes Park you'll find the *"BEAR PAW CABIN on the RIVER". *Our cabin is a one-bedroom with additional sleeping up to 4 guests. Blackhawk Lodges are located on the Fall River 2 mi. from the Rocky Mountain National Park. We have real log cabins with the beds in a loft bedroom, full kitchens, wood-burning fireplaces, CCTV, charcoal grills, picnic tables, and we have a hot tub by Fall River. Some have a bedroom on ground level. No Pets. It is 5 minutes (2 miles) to downtown Estes Park and 10 minutes to Rocky Mountain National Park. Wish you had a little cabin of your own in the Rockies? Come to Bradshaw Cottages and that’s how you will feel, whether your stay is for a night, a week, or a month! 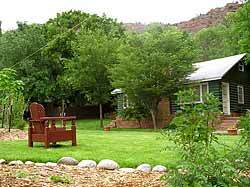 Our cottages have been meeting the lodging needs of Rocky Mountain travelers for over 75 years. We have all the modern conveniences you need, but life will feel much calmer and simpler as you take it easy and listen to the river flowing by. 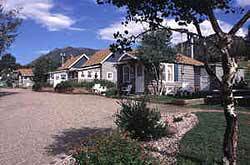 At Bradshaw Cottages, we want to be part of your Estes Park/Rocky Mountain vacation. Let us provide the cottage, the river, and all the conveniences of downtown Estes Park... Walk to many downtown shops, attractions, and restaurants. The Rocky Mountain National Park entrance is a short 3 mile drive and the starting point for many hikes and picnics. Hope to see you soon at Bradshaw Cottages in Estes Park! Braeside Cabin for two is a special retreat for discerning guests who are searching for a quiet and private vacation home away from home. The moss rock woodburning fireplace, beautiful wood panelling, vaulted ceiling and welcoming porch are just a few of the amenities that provide a true mountain experience. Nestled in pine trees, just 3 miles from downtown Estes Park and 1 mile from the YMCA, Braeside is beautifully appointed and fully equipped. Well behaved pets are always welcome at Braeside and can be left unattended in the cabin though crating is encouraged if guests think that it is necessary. There is no charge for pets - unless they redecorate. We provide private, quiet, clean, non-smoking modern cottages. 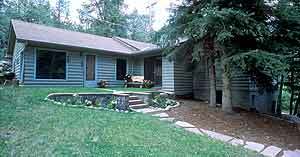 The cottages are located individually, surrounded by trees and lawn. Each cottage has sufficient area for privacy. Two cottages have redwood decks and one has a covered, carpeted front porch-perfect for enjoying the first cup of coffee of the day or the last view of the evening. All cottages are complete housekeeping units with wood burning fireplaces (wood included), cable TV, outdoor grills and facilities for outdoor dining and relaxing. 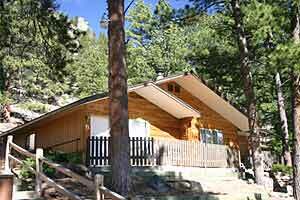 We are located within easy walking distance to the YMCA camp and Rocky Mountain National Park. We are three miles from town and close to horseback riding, hiking and fishing. Please click on the above link to see interior pictures, exterior pictures and much more. Your pet is more than welcome at Cliffside and we rent to non smokers only. Affordable family resort on the river offering cabins and cottages with kitchens. Nestled in the majestic pines of Castle Mountain, located two miles from the National Park. Romantic cabins with private outdoor hot tubs. Ideal for couples! 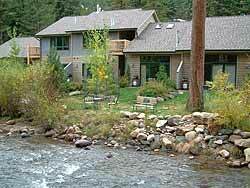 Luxurious vacation homes located along the Big Thompson River, walk into RMNP, river and mountain views. Restored Estes Park family home filled with Colorado charm surrounded by an acre of pines and aspens. Relax on the river in the Rockies at the Bear Paw Cabin on the River. 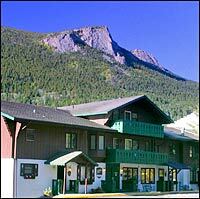 Let us accomodate you on your trip to Estes Park! Log Cabins with Fireplaces, Sleeping Lofts and Kitchens on Fall River. 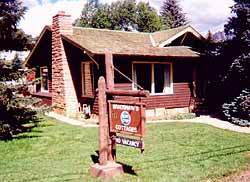 Great Lodging on the Big Thompson River — Providing lodging to Rocky Mountain travelers for over 75 years! "Private, secluded cabin near RMNP!" For a vacation you will remember and want to repeat. We are a small family-run cottage village with fireplaces and great views of the mountains. Within walking distance to restaurants, shopping and activities. A mountain home away from home...Each one unique. Peaceful Valley Ranch- secluded cabins, wilderness riding and hiking, river and pond fishing, great dining, spectacular scenery, western hospitality. 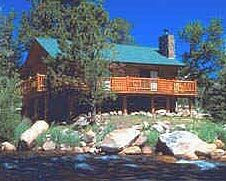 Charming cabins and lodge on the Fall River just minutes from downtown Estes Park. 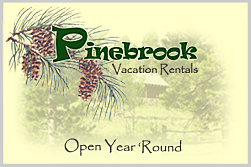 Estes Park's Premiere Family Vacation Getaway, where you can rent for a day or a week, or own forever. Relax your mind, renew your spirit and enjoy the great outdoors in the heart of the Rocky Mountains. Comfortable cabins by the Big Thompson River and near the entrance to Rocky Mountain National Park. 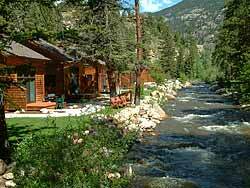 "Cabins on the Big Thompson River "
"SOLITUDE, not just a name…it’s the feeling you get!" 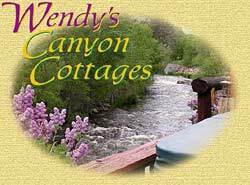 Cozy cottage and luxury Spa Suites located on the beautiful Fall River in Estes Park. 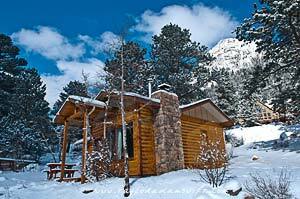 Rustic to luxury cabins on 15 acres next to Rocky Mountain National Park. Jacuzzi, hot tubs and fireplaces available. Mountainside Cabins Adjacent to Rocky Mountain National Park. Open year round, The Woodlands is your best choice when visiting Estes Park. Jellystone Park offers activity programs for Kids and Adults.